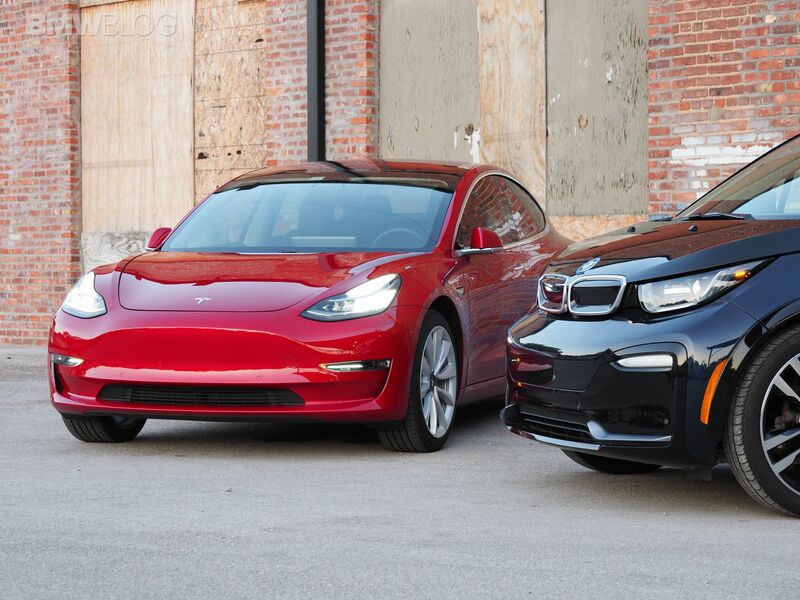 The only two choices when it comes to a $50,000-$60,000 premium brand all electric car are the BMW i3 and the Tesla Model 3. BMW launched their all-electric BMW i3 in 2014, winning multiple green awards for their EV’s eco-friendly lightweight construction, production methods and use of sustainable materials. The Tesla Model 3 has been one of the most anticipated cars ever, irrespective of it being an EV. Around 500,000 people put down a$1,000 deposit, sight unseen to buy one. Both are clean sheet design, purpose-built electric cars. Despite similar price points and that battery packs reside in the floor board, both company’s have completely different philosophies in their approach to an EV. 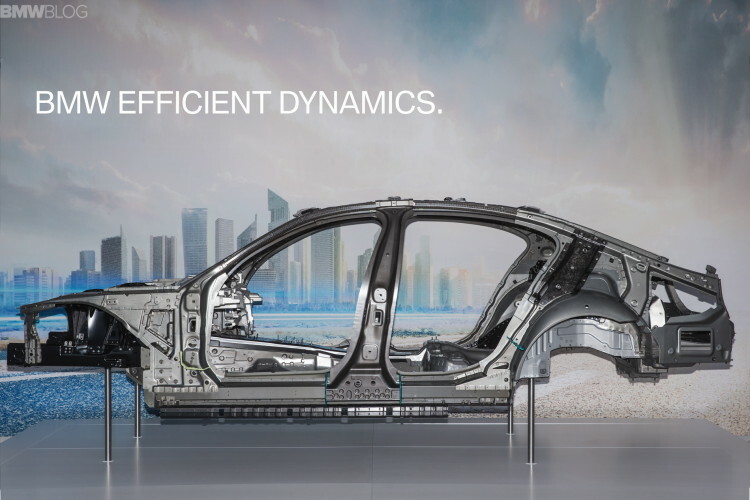 BMW’s philosophy was to use cutting edge materials and processes to make the lightest weight vehicle possible. The launch of the i3 represented the first time ever Carbon Fiber Reinforced Plastic (CFRP) was used in mass market vehicle. This necessitated a ton of R&D to manufacture and produce on a large scale. BMW saw the i3 as a “mega city” car, and one that could take care of the range you needed in a typical day of city living. In 2017, BMW increased the overall battery pack capacity of the i3 from 22 kWh to 33 kWh which added nearly 50 percent more range. BMW did so using the same total of 96 individual small Samsung batteries, however each small battery was now rated at 94 Ah each, up from 60 Ah each. With the i3, BMW believes that you should only carry around a battery pack that will get you through the day typical driving needs, not lug a massive pack around you will rarely use the full capacity of. If you want long distance driving, BMW wants you to use an internal combustion car such as a plug in hybrid 530e. 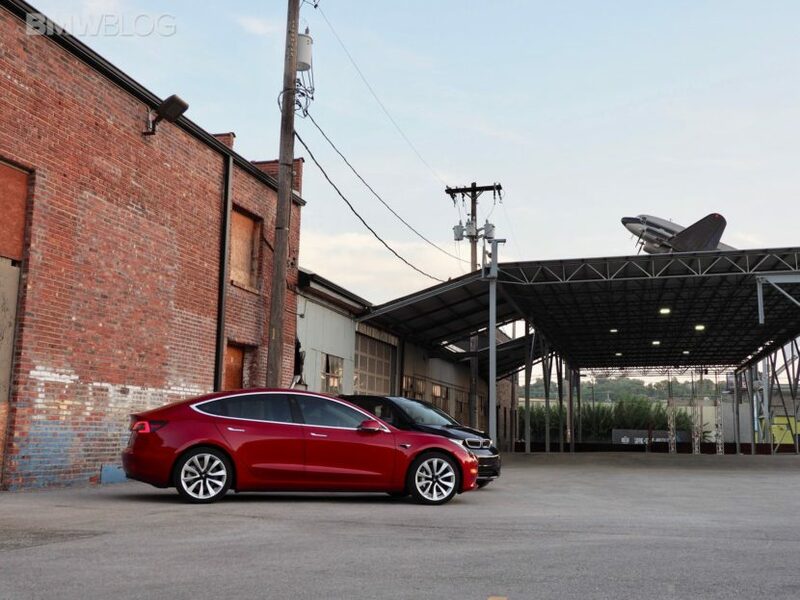 Tesla’s overall philosophy is to accelerate the transition of mankind to sustainable transportation, and the Model 3 is Tesla’s third step in this grand vision. The Model 3 is meant to bring an “affordable” EV to market for wider adoption. Tesla realized that in order for electric vehicle adoption to succeed, there needed to be a cohesive charging network. Such a fast charging network didn’t exist so they built their own Supercharging Network which is now with in 150 miles of 99 percent of the United States population. When Tesla wants to add more capacity to a given vehicle of theirs, they just add more individual small batteries. For example, a Model 3 stand battery has 2,976 individual cells in its pack and there are 4,416 cells in long range battery. Tesla believes they should provide a pack that is big enough to allow long distance travel not just city driving. When it comes to construction materials, the BMW i3 has a unique Carbon Fiber Reinforced Plastic (CFRP) construction along with eco-friendly materials such as Eucalyptus wood and olive leaf tanned leather. BMW sources the CFRP from a plant that is hydro-powered from a nearby dam. Even BMW’s plant in Leipzig where the i3 is manufactured runs on 100 percent renewable energy. BMW’s CFRP has also made it to other models such as the Carbon Core of the 7 Series. BMW brings years of quality automotive manufacturing to the i3. Tesla has been knocked on quality issues on the Model 3. Though this seems less prevalent now on Model 3’s than ones that were initially manufactured. The Model 3 I drove for this test was VIN 15XXX has traveled 13,000+ miles without any issues. The i3s we drove had only 6,500 miles and, similarly, has had no issues. In general, electric cars have fewer problems and less maintenance requirements than internal combustion cars. 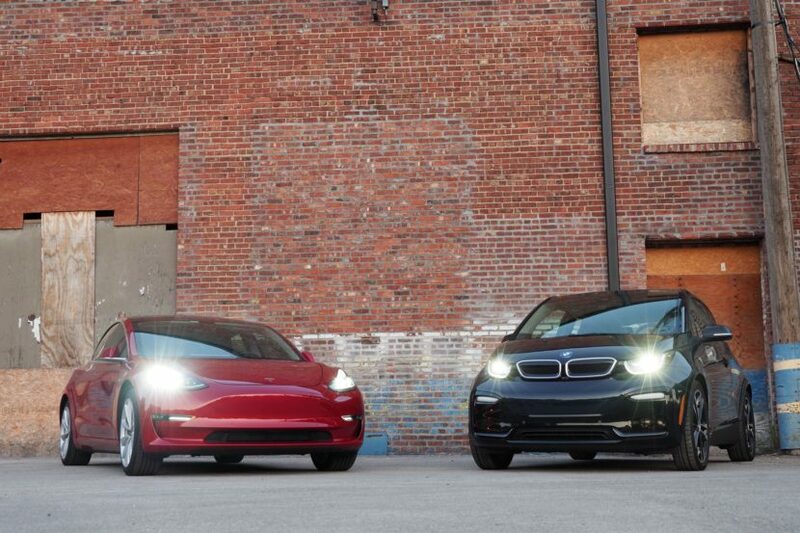 Both the Model 3 and the BMW i3 are unabashedly EV-looking. They look unlike any petrol powered car on the market. The BMW i3’s styling has been described as quirky with its shortish wheelbase, super narrow tires and tall profile. One of my favorite pictures of the i3 is it parked next to an 80s 3 Series BMW where you realize that the i3 is bigger than you would think. I have found the i3 very versatile, it has two suicide doors that open to the back seats. You would be amazed and what you can get in it’s hatch back once you lay down the rear seats. I have even transported a full size bass in it. 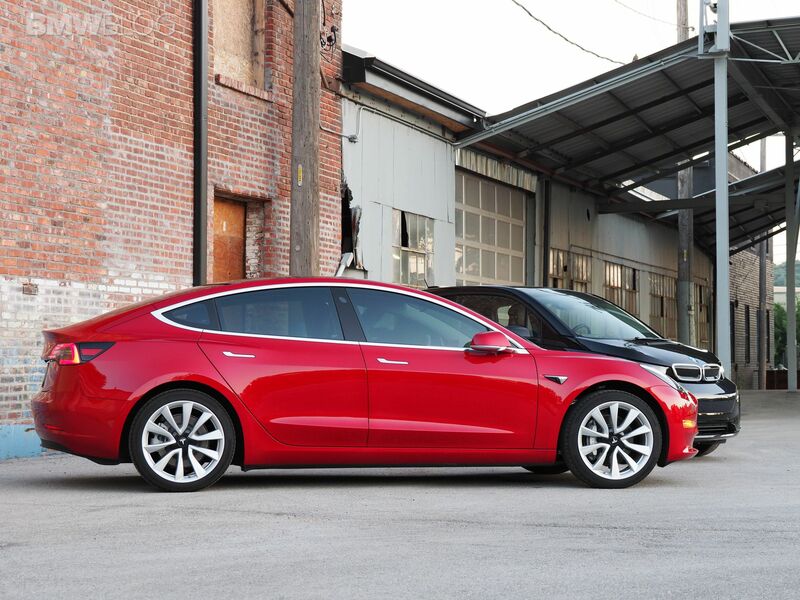 The Model 3 styling is unmistakably Tesla, but not as sleek as the Model S. The Model 3 is 11 inches shorter and 4 inches narrower than the S, yet over 2 feet longer than the i3. The interior seats 5 compared to BMW i3s’ 4 seats. The Model 3 styling does have a more greenhouse style effect with an all glass UV coated roof. The Model 3 does not offer a sunroof where as the BMW i3 it is optional. The Model 3 has four doors and front and rear trunks. The lack of the hatchback in the Model 3 does impact its convenience however it does have fold down rear seats. The Model 3’s most unique feature though is in its interior with a sole 15.4” touchscreen LCD center display. Everything is displayed here: speed, gear, traffic, tire pressure, music, A/C and navigation. It can be a bit overwhelming to learn all the functions. The Model 3’s display is incredibly fast at responding to commands, loads and manipulates maps faster than any car I’ve seen. The main knock on the LCD display is that the speedometer is off to the right of the steering wheel. This, though, is not that unusual as this design is found on BMW’s Mini Coopers and the Z8. 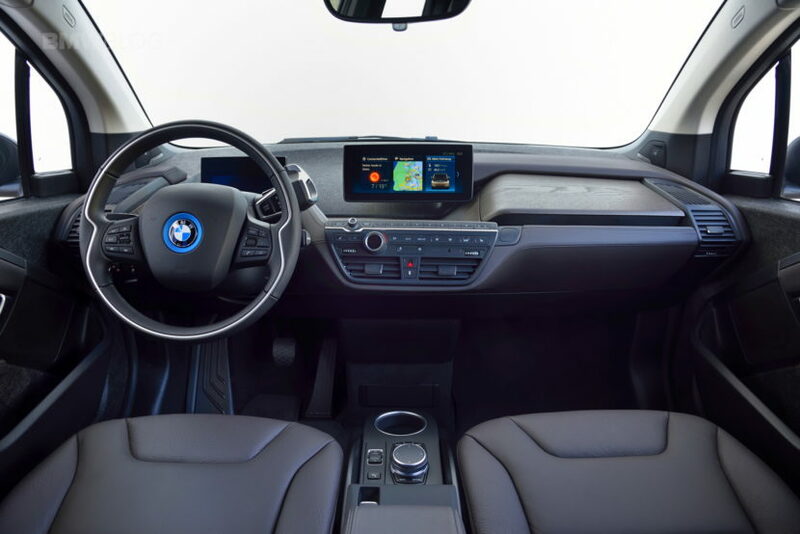 The interior of the i3 is also futuristic with no transmission tunnel on the floor board. The transmission selector is an odd knob up on the right of the steer wheels stalk that you twist forward or back. There are two LCD displays on the i3. One for the Speedo/range display and the other that is larger and display’s navigation, entertainment and vital car monitors, such as tire pressure. Seating in the i3 is very upright which affords a great view for the driver. Ultimately, looks are in the eye of the beholder and I think when it comes to styling between the i3 and the Model 3, it is a tie. The two most common questions when I drive an electric car are what is its range, how long does it take to charge. The pure electric i3s with its 33 kWh battery has an EPA rated range of 107 miles. 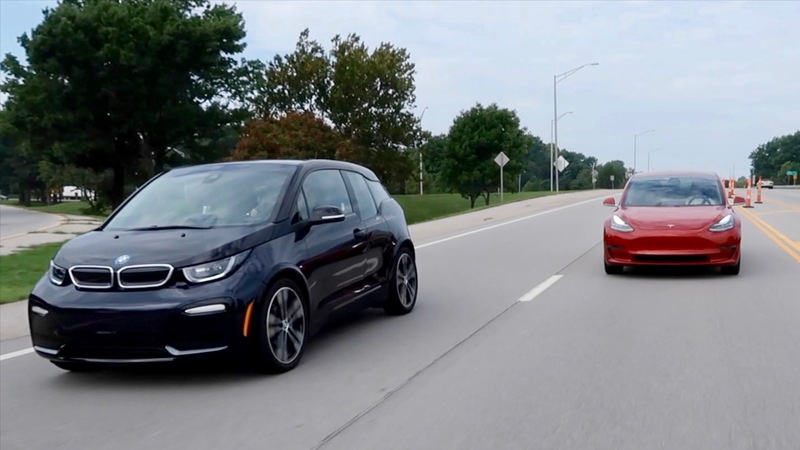 BMW does offer a range extender i3s for $3,850 over the pure electric i3 which provides a two-cylinder onboard generator and a 2.3 gallon gas tank which increases the overall range of the i3 to 180 miles. This has proven a popular option with customers as in the US, BMW has stated they sell three i3 REx to one pure electric i3. Both the Tesla and BMW i3s have active thermal management to keep their batteries cool or warm depending on ambient temperatures and use. The Tesla Model 3 Long Range has a rated range of 310 miles. Tesla has been mum on the battery size now, preferring to emphasize distance over battery capacity, though many believe it is 80 kWh. All Model 3s are pure EVs, there is no range extender/gas generator option as in a BMW i3, though they have access to Tesla’s incredible SuperCharger network. Charge time for the i3s is about 4.8 hrs 0-100% on a Level 2 J1772 and 0-80% charge in 30 min on a Level 3 DC charger at 50 kW. As a Tesla’s battery is much larger, charging takes longer. The Model 3 home charging comes with more capability than the BMW as the Model 3 is able able to take home charge up to 48 amps or approximately 11 kW. A typical 30 amp home 1772 Charger, though should take 10-11 hours on a Model 3 from near empty, though a 48 amp charge would decade that time to about 8 hours. A Tesla SuperCharger can add up energy at staggering rates up to 120 kW. This is more than twice possible DC charge rate in a BMW i3. The winner in the battery and charging category is Tesla by far. 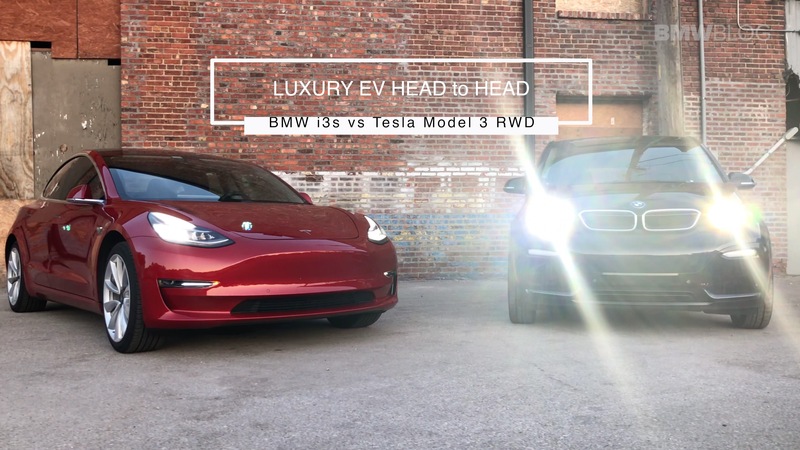 We chose a rear-wheel drive Long Range Tesla Model 3 to compare to the BMW i3s as both are rear wheel drive, battery packs reside in the floor board and when similarly optioned closely approximates the BMW i3’s price. Both EVs have one-pedal driving style where lift off slows the car and returns energy to the battery. 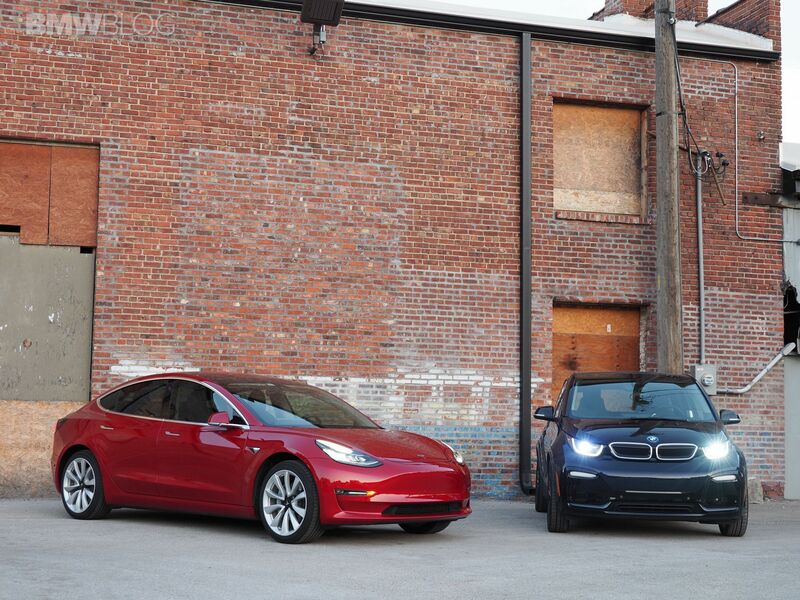 There is nothing like the instant torque of an electric motor and both EVs are a blast to drive. The i3s accelerates from 0-60 mph in 6.8 seconds. The Tesla Model 3 is slightly faster 0-60 at 5.6 seconds. I really like how both put the power down to the rear wheels and really have sporty chassis setups. I dare say the Model 3 handles like the last generation (E90) BMW 3 Series, it’s just that balanced. Nothing beats the turning radius of the i3 though and it make so city driving and parking a breeze. The i3s handles better in my opinion better in around town/auto cross driving than the Model 3. The Model 3 though handles better on fast sweepers, above 45 mph and even more so on the highway. Longer wheelbases, lower roof lines, lower center of gravity are inherently more stable and explains the differences in handling as the i3s is 7 inches taller and is more than two feet shorter than the Model 3. When it comes to Driving Dynamics it is a Tie. The tech options on a Tesla are limited to whether on not you want Autopilot and Full Self-Driving. In my opinion, Tesla’s Autopilot, is a Tesla’s defining driving feature. No one comes close to this currently. BMW does have Active Cruise Control on the i3, but it’s no where near as responsive as even Tesla’s Active Cruise Control. The BMW is sluggish in comparison, has a much narrow field of view when spotting merging cars and is slow to catch up to traffic. The i3 gives you four car length follow options and unfortunately does not remember your preference the next time you drive. The Tesla gives you up to 6 car lengths of follow distance and remembers your last setting. BMW’s Active Cruise deactivates frequently if the sun hits the eye above the rear view mirror. It also does not seem to recognize silver gas trucks from behind. Though I harp on the i3’s Active Cruise, I still use it frequently despite its shortcomings because active cruise in an EV makes driving one much more easy than having to constantly feather the throttle. The Tesla’s Full Self Driving, FSD, option should come with air quotes as it doesn’t work and regulators haven’t passed rules yet that would allow it. Tesla recently put out a statement that if you option FSD on a Model 3, you would get required hardware in the future that would make full self-driving possible as a free future upgrade. Tesla says there are enough sensors on the car with eight cameras, 12 ultrasonic sensors and forward-facing radar, but they need more computing power for FSD. BMW offers a Tech/Driver Assist Package as well as Apple Car Play, both of which were on our tester. BMW’s integration in terms of how you navigate music selection from your phone or iPod is much much better than Tesla’s. If you play music off your phone in the Model 3, you need to physically pickup the device to select different playlists or search for music. Streaming music service though is better on Tesla compared to satellite radio that comes on the i3. Surprisingly the i3 has no blind spot detection, a remarkable omission as incorporating it into side mirrors are standard in cars half the price. Park Distance control oddly is not in the Tech package, but is an additional $750. Further, if you opt for the i3s, you loose “self-parking” unlike the non-sport versions of the i3. The Model 3 does offer self-parking and summon, but you need the $5,000 Enhanced Autopilot option. Tesla does have blind spot detection but its display is on the center screen instead of mirrors. Both Tesla and BMW offer apps on your phone to check on your car. Tesla’s app though offers much more functionality. If someone is driving the i3, the app does not display any info. The Tesla’s app will show you where the car is on a map and how fast and what direction is traveling. Software updates for the Tesla come over-the-air which can have big impacts on how the car functions. 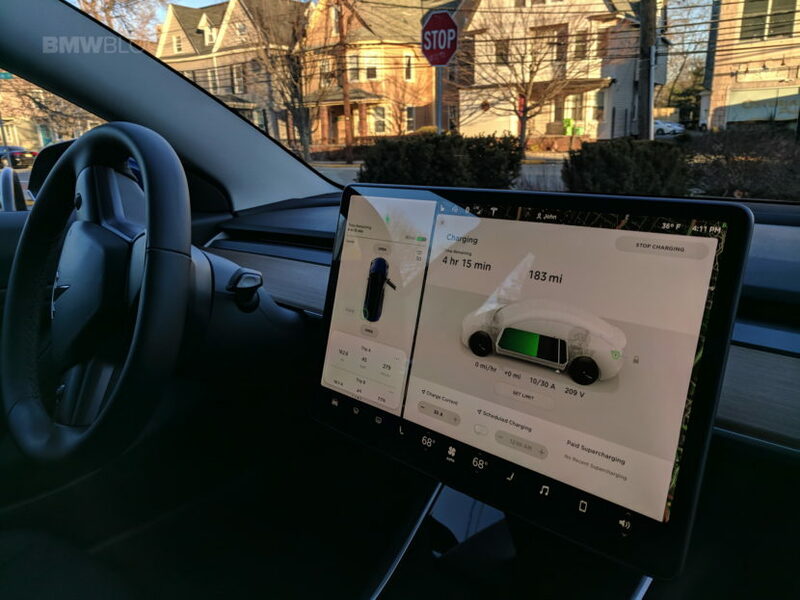 For example when the Model 3 launched, Autopilot adjustments had to be made by hitting the plus/minus on the top left of the center console screen. Then with an over-the-air update, all Model 3s now can use a thumb wheel on the right to change the speed of the car without taking your eyes off the road. To update the BMW i3’s software, it requires a dealer visit, though Maps will update over-the-air now. Tesla will let you set the charge range of its battery, with the BMW i3, you cannot. Want the Tesla to stop charging at 70 percent, just select it on the app or the LCD screen in the car. 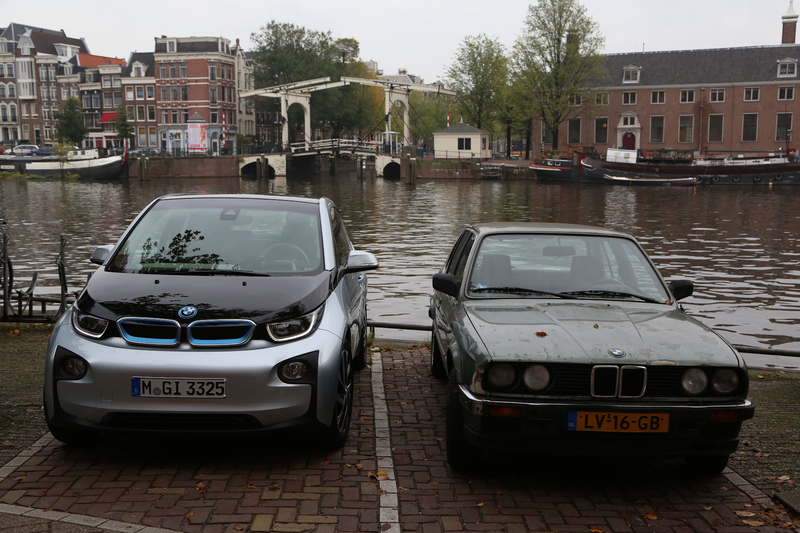 Both cars allow delay charging start time so you can charge at night for lower off peak electricity rates. Now wait, you said these two option out similarly, within $1,000 dollars of each other. Well yes, that is what the MSRP of the two respectively show. However, and this is a big however, no one pays MSRP for an i3 and everyone pays MSRP for a Tesla. The market will bear what it will bear. Model 3s sell at sticker. There is no discount. Tesla does not even offer a lease on it. People literally lined up just to order the Model 3. The BMW i3, however, discounts abound. For example with a Costco discount buyers program, take $10,000 off, then BMW offers a $2,500 loyalty discount, and some dealers have been taking off another $4,500. Next add in the federal tax credit and you are looking at stunning $24,500 off sticker a $50,000 car. The Model 3 will have the full $7,500 tax credit through the end of 2018 but then it will decease. Price Winner: BMW. It’s more available and more affordable. 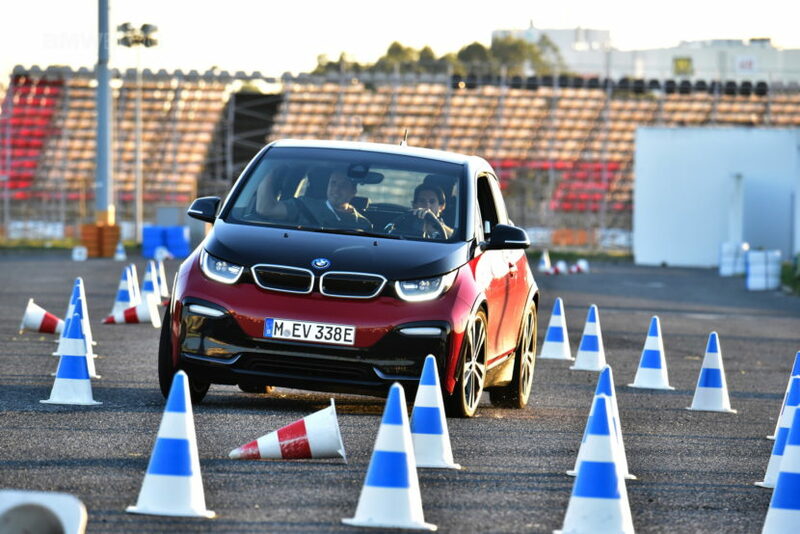 The BMW i3 is a great car with un-matched lightweight build, eco friendly materials and has enough range for most daily drives. Nothing gets around a crowded downtown easier than an i3 with its tight turning radius and ease of parking. 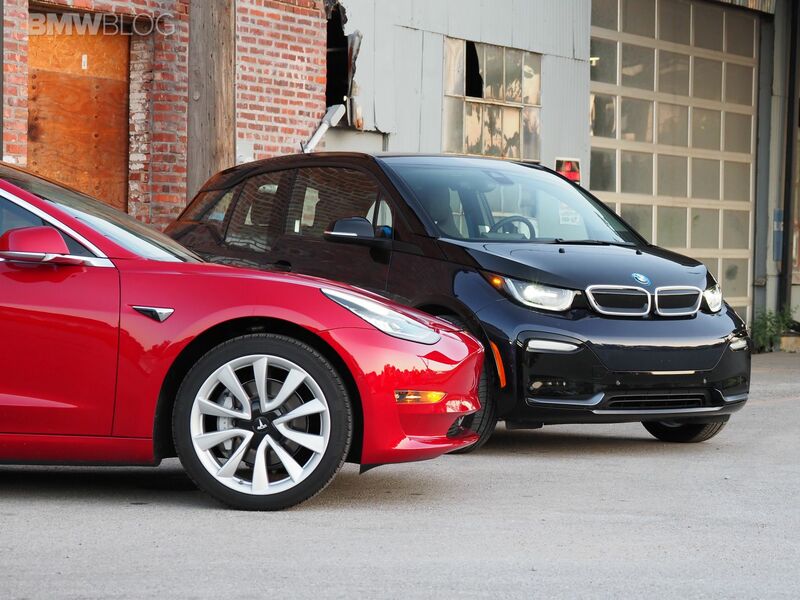 The i3, though, is best as a city car or someone’s second car. The Model 3 forces you to make fewer compromises, however, to drive an EV. The Model 3 seats five and can easily be your only car. The range of the Model 3 is far superior at 310 miles and with a Tesla you are not only buying the car but into Tesla’s Super Charging network. BMW does have ChargeNow network but vast expanses of the United States are not covered by it. The real competition for the Tesla Model 3 though, isn’t really the BMW i3. It’s the BMW 3 Series, and that lets you know just how good the Tesla Model 3 is. Ultimately the Tesla Model 3 wins this overall comparison. It is not that we don’t love the i3. I’ve owned two of them and they are great cars. It’s just the they have a hard time being your only car. Technology and Driving Assistant Package $2500.